I’ve made a big decision. I’ve walked away from a full time job and for the first time since leaving university more than twenty years ago I am officially unemployed. Well, I’m self-employed. Yes, I’ve joined the ‘gig economy’ (now I need to get my first gig). The bottom line is we’ve decided that having two pre-school children isn’t compatible with me and Mrs B working full time in traditional nine to five (actually nine to six) jobs. I’ve been a stay at home dad since I took a period of parental leave at the start of February. But as the time for me to return to work drew nearer we realised that the old way of doing things was no longer a viable option. This was the biggest shock after having children; the eye-watering cost of paying someone else to look after them. One was bearable but the cost of childcare for two children full time was going to eat up 90% of my salary every month. Now, obviously it wouldn’t only have been me paying for it. But it doesn’t really matter how you cut the financial cake – if the childcare costs equal or exceed the amount of money one of you is bringing home each month (after tax and NI) then one of you is essentially working to pay for someone else to look after your children. We made a spreadsheet with everything accounted for right down to morning coffees, magazines, and the beer/wine fund. Next we tried to reduce as many expenses as possible. But even being super careful with money the fact was that we were only a couple of hundred pounds a month better off with two of us working all those hours. Childcare costs vary a lot around the country and I am aware that living in London means we are paying more than many people. But the cheapest nursery place we could find was £55 a day per child and, to save you getting out a calculator, for two children that’s roughly £2,300 a month. Even taking into account the 15 hours a week of free hours of childcare our three year old is entitled to didn’t bring it down by much. This is mainly because you don’t get to claim those free hours every week – it’s for 38 weeks so you have to average that out over the year. I’d say it roughly results in a 20% discount per day. If you can’t risk leaving your job, or don’t want to step off the career ladder at this point in your life, or simply don’t want to be a stay at home parent then working to hand over your salary for childcare may be the only option. I guess in that case you grin and bear it until the eldest starts school and the costs begin to diminish. The Family and Childcare Trust recently estimated that families are spending up to 45% of their income on childcare. It’s no wonder so many parents (usually mums) are forced to leave the workplace. The Government’s plan to offer all working parents 30 hours a week of free childcare for three and four year olds from September will help provided you are eligible. Once we started looking it quickly became clear that simply finding a nursery or childminder who could actually take both boys all day from Monday to Friday was like looking for El Dorado (no, not the TV series). The Family Childcare Trust’s 2017 Childcare Survey found that most local authorities in England have insufficient care for two-year-olds and our experience reflects that. Even if we’d been able to find places at two different nurseries the idea of having to split the boys between two (or more) childcare providers was too stressful to seriously contemplate. We couldn’t imagine having to both do drop-offs in different directions each morning before heading back to the station. And it would have been hard enough for one of us to get out of work early to do the evening pick up let alone two. As the weeks of my parental leave sped by the best we’d managed to find was a nursery we liked that was also affordable and *only* a 15 minute drive from our house. It would still have meant leaving the car there and walking on to the nearest station but it was do-able. They could only offer us four days a week for our three year old and two days for our one year old. We’d also discovered that baby places are much harder to find as the nursery has to have a higher ratio of staff for babies and toddlers than they do for children aged two and up. Choosing to stay at home to look after your children is not an easy decision. It’s hard work for one thing, harder than I found going into the office. But really the question should be what’s best for the little ones. Now, before anyone gets riled, I don’t think sending your children to nursery or to a childminder or hiring a nanny is going to harm them or is wrong on any moral level. It’s a personal choice and no one should be made to feel guilty whether they want to be a full time working parent or stay at home or do a bit of both. For us, the idea of our eldest being in full time nursery felt OK (ish). He was certainly ready for the structure and socialising with a wider pool of children. But even for a three year old being away from home for ten hours a day felt like a big ask. He no longer naps but he does get tired toward the end of the day and it would have meant rushing home with barely enough time for winding down before bath and bedtime. When it came to our baby boy (even at 14 months he still seems very much a baby and not a toddler) we baulked at the reality. We were faced with the hurdle and we refused to jump. I think having come to parenthood a bit later in life also contributed to how we felt. Had we really waited all this time only to hand our second (and last) baby over to someone else so soon? The cliche about the early years flying by is proving to be true and I knew I wasn’t going to wish I’d spent more time in the office once the boys had started school. However, having spent so many hours dealing with the innate drudgery and stress of parenting two pre-schoolers I also knew I didn’t want to be a full time stay at home dad. So we needed to find a middle way. I am fortunate that the thing I’ve chosen to do to earn my keep doesn’t have to be tied to a place or time, although my job as an in-house PR for a charity was. I needed to be in that office responding to requests from the media, and having face to face contact with colleagues to make decisions when things were hectic (which was most days). However, I had seen other people (including some parent bloggers) make the leap to being freelancers, and I felt sure that there were other ways to use my skills that were less wedded to a traditional job. As you get older in the workplace I think many people face a choice of either trying to get further up the ladder into management or doing something completely different. I don’t know if I’ll ever get to retire in the traditional sense but if that was on the cards I’m more than half way through my working life. So weighing everything up there really didn’t feel like anything to lose. There’d never be a better time to take a leap as we were going to be cash-poor anyway. And if all my earnings are going on childcare I may as well work fewer days and spend more time with our boys. I am also looking forward to learning new skills, meeting new people, and pushing out of my comfort zone, which are also all things I think it’s vital to keep doing whatever age you are. I will miss some things about working in a full time job; the people, the paid holidays, and the security. But I will not miss being jammed onto a packed train every day or sitting in the same seat in the same building and going to the same Pret for lunch! I’m doing a lot of reading and am very grateful to the bloggers out there who’ve made the leap and written very wise posts about it. (I’ve listed some below.) Getting to grips with tax and insurance and being a lot more organised has also been a steep learning curve. And now I really need to get out there and start finding clients; I will keep you updated on my self-employment adventure. If you have any advice do share it in a comment for others to find. And if you have a copywriting, PR, or social media problem that I can help you to solve please get in touch! Oh I really enjoyed reading this. I am a stay at home mum because, like you, we’d be spending so much of my salary on childcare that it wasn’t worth missing out on spending the day with them for. It’s great that you’re striking out on your own and I know it takes a lot of guts. I really wish you well in your new chapter and I#m looking forward to following your journey. Thanks Mackenzie, it’s good to know there are other people struggling with this. The school issue is looming and I have never understood how both parents keep working full time around school pick ups. Now i realise many don’t! 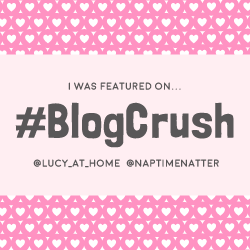 OH PS: I have chosen this post to feature on the blog crush linky this week. Sounds like you’ve chosen a great career to fit around school days and holidays. Don’t call me brave! Let’s see if i can make this work…arrgh! Good luck with the change! It is really challenging when you have kids – having a career and family don’t seem to mesh very well!